Victoza belongs to a group of drugs known as glucagon-like peptide-1 (GLP-1) receptor agonists because they resemble and mimic the action of human GLP-1 hormone (incretin hormone). They are also known as incretin mimetics. It is an injectable drug that reduces blood glucose by increasing insulin production by the pancreas, slows the absorption of glucose from the gut, reduces the activity of glucagon (a hormone that increases release of glucose from the liver), and reduces appetite. Victoza is used for treating type 2 diabetes mellitus in conjunction with diet and exercise. It is not used for treating type-1 diabetes or diabetic ketoacidosis and it should not be used in place of insulin when patients require insulin. Victoza monotherapy: Victoza 1.2 mg or 1. 8 mg reduced HbA1c and fasting glucose better than glimepiride (Amaryl) 8 mg daily after 52 weeks of treatment. Average changes in HbA1c were -0.8% (Victoza 1.2 mg), -1.1% (Victoza 1.8 mg), and -0.5% (glimepiride 8 mg). Percent of patients achieving HbA1c less than 7% was 43% (Victoza 1.2 mg), 51% (Victoza 1.8 mg), and 28% (glimepiride). Average changes in fasting glucose were -15 mg/dl (Victoza 1.2 mg), -26 mg/dl (Victoza 1.8 mg), and -5 mg/dl (glimepiride 8 mg). Average changes in body weight were -2.6 kg (Victoza 1.2 mg), -2.8 kg (Victoza 1.8 mg), and -1.5 kg (glimepiride). Victoza versus Byetta (exenatide): Victoza 1.8 mg once daily was more effective than Byetta 10 mg twice daily in reducing HbA1c in patients taking metformin and/or sulfonylurea. Change in HbA1c after 26 weeks was -1.1% (Victoza) compared to -0.8% (Byetta). Changes in fasting glucose were -29 mg/dl (Victoza) and -11 mg/dl (Byetta). 54% of Victoza treated patients versus 43% of Byetta treated patients achieved HbA1c less than 7%. The average weight loss was approximately 3 kg in both groups. Second FDA approved incretin mimetic (GLP-1 agonist). Patients can develop antibodies which may reduce the effect of Victoza. Liraglutide reduces appetite and causes weight loss and is marketed as Saxenda for weight management. Victoza was more effective than Byetta in reducing blood glucose levels in one study. Serious: Serious side effects reported include pancreatitis, reduced kidney function, gallbladder disease, and suicidal thoughts. Victoza causes thyroid C-cell tumors at clinically relevant exposures in rats and mice. It is unknown whether Victoza causes thyroid C-cell tumors, including medullary thyroid carcinoma (MTC) in humans. It should not be used in patients with a personal or family history of MTC or in patients with Multiple Endocrine Neoplasia syndrome type 2 (MEN 2). 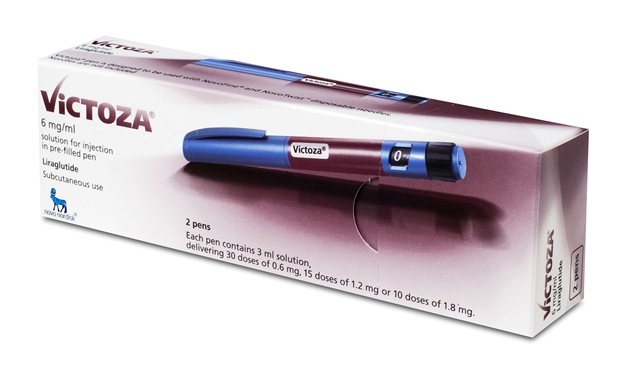 Victoza pen: Victoza is available as pre-filled multiple dose pens containing 18 mg in 3 ml (6 mg/ml). The initial dose is 0.6 mg injected under skin (thigh, abdomen, or upper arm) once daily for one week and is used for building tolerance to nausea and vomiting due to Victoza; it is not effective for reducing blood glucose. After 1 week the dose is increased to 1.2 mg daily and the maximum dose is 1.8 mg once daily. Victoza slows movement of food and drugs through the stomach and intestines and therefore may reduce the absorption of oral drugs. Administration of oral drugs and Victoza should be separated. Victoza's price is $372 for a packet of two pens and $540 for a packet containing 3 pens. For prescription cost assistance visit the Novo Nordisk Prescription Assistance Program. A Victoza savings card (coupon) is also available. Reference: Victoza FDA Prescribing Information and Medication Guide.